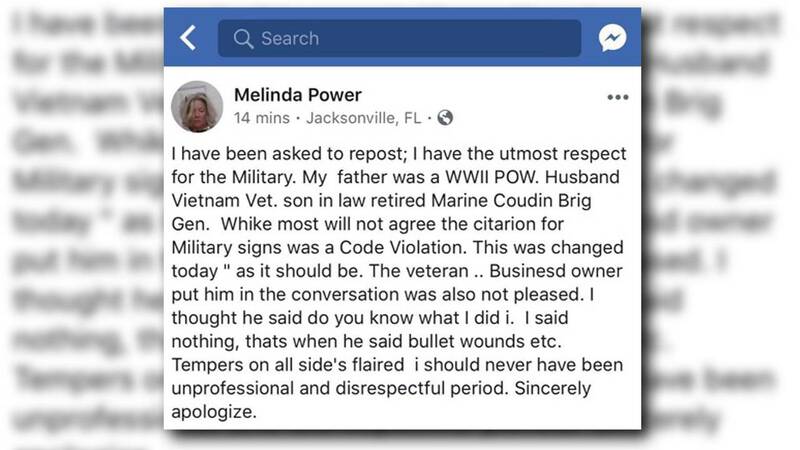 JACKSONVILLE, Fla. - A Jacksonville city inspector apologized on social media Monday for a controversy that was sparked when she issued a warning citation to a business for flying military flags -- which she said was a code violation. Melinda Power later removed the Facebook post, but screen shots of it continue to be circulated on social media. Power came under fire after she cited Jaguar Power Sports on the city's Westside for flying flags on its roof that represent each branch of the military. The rooftop display also includes two United States flags and a Jacksonville Jaguars flag. 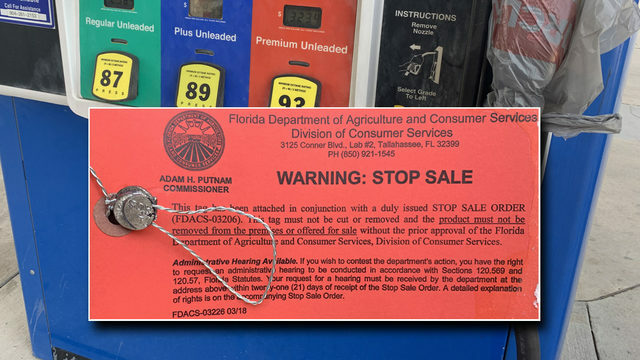 Employees at the business said a customer overheard Power issuing the warning, which told the business to correct the violation or risk "prosecution for the offense." 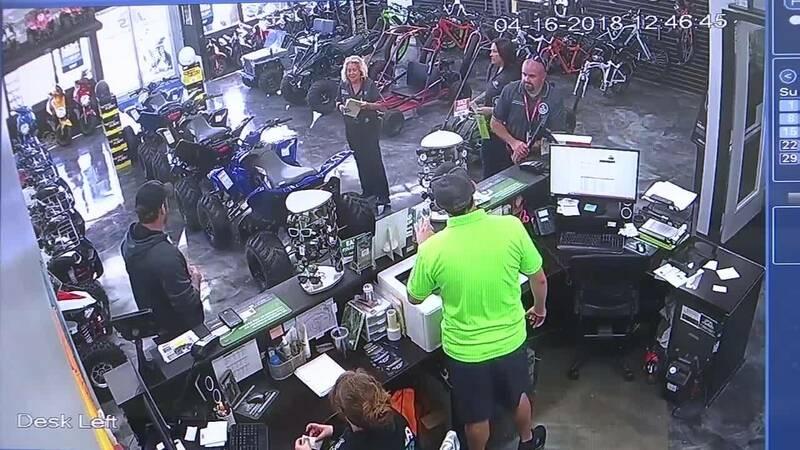 The customer, who is a military veteran, got upset, and a confrontation between the two was captured on surveillance video. Employees said Power insulted the customer after he told her he almost lost his life serving in the military. "She gets in his face this close and says, 'You did nothing for this country,'" store employee Katie Klasse said. In her Facebook post, Power described the incident differently, saying she thought the customer had asked, "Do you know what I did?" And that she responded, "Nothing." She said after that, tempers flared, and she admitted: "I should never have been unprofessional and disrespectful period. Sincerely apologize." Mayor Lenny Curry stepped in after word of the confrontation and the warning citation that prompted it reached his office. Curry said Monday night that he has directed city staff to treat military flags the same as the U.S. flag when on display. Curry's chief of staff indicated that the city will be investigating the incident and is reviewing the current city ordinances on flags "to ensure accurate information was shared." People answering the phones Tuesday morning at City Hall were inundated with callers on the flag citation. Of 50 call taken in the first hour of business, most wanted the employee fired. The managers of Jaguar Power Sports were able to rip up the warning and keep their flags flying. 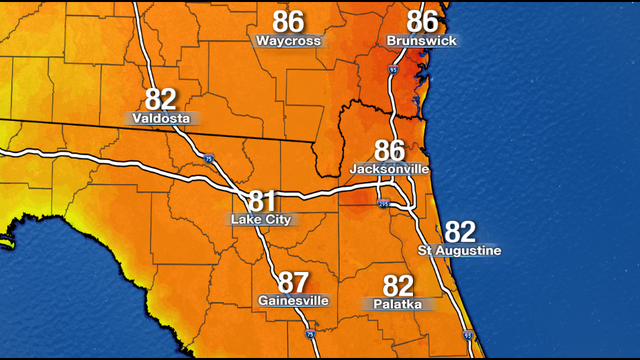 News4Jax contacted Power for an interview, but she directed us to the city of Jacksonville for any comment.